Home » Helix Mattress Giveaway 2018! Happy giveaway day, gang! You’re probably thinking: Yay, if I win, I get to pick a mattress in the size of my choosing! Well, yes and no. Yes, you can pick the size you want. But this time, you get to pick from nine different mattresses within the Helix line. I know, right?! All you have to do is scroll, enter, and think about which mattress you would choose! Helix is known for its wide variety of mattresses, and they recently introduced six more to the line! So, it really all depends on what you’re looking for. Is it the plush feel and soft pressure relief of the Helix Moonlight mattress? Or perhaps the balanced support of the medium-firm Helix Midnight mattress? So many beds… so little time. In addition to the six new Helix mattresses, there are three Helix speciality mattresses up for grabs too! The Nightfall mattress, for example, is built with maximum support designed to accommodate big and tall sleepers. Meanwhile, the Dual Balanced and Dual Extra mattresses are designed to feel plush on one side, and firm on the other. I know — so many choices! If I were you, I’d check out our written review of some of these Helix mattresses to get a better idea of what you’ll pick if you win! Never too late to start planning your next sleep adventure, ya’ know? Good luck, everybody! Heard its the best, wish I knew!! This looks wonderful! I think I could really get a good night’s sleep on this mattress. I like that you get to pick from nine different mattresses within the Helix line. It sounds like a great mattress. My daughter could use a medium-firm mattress. I love Love LOVE this! I so could use a new mattress. My current one is from 1978 and it’s hard as a rock! Needing an upgrade! That’s great that there are so many different choices. Not everyone wants a super soft mattress. Thanks for the much needed oppurtunity! I would love to win. I can’t sleep on my current old 15 year old lumpy mattress. I could desperately use a good night’s sleep on an amazing mattress! It’s great there are so many options to choose from. Thank you for the giveaway! 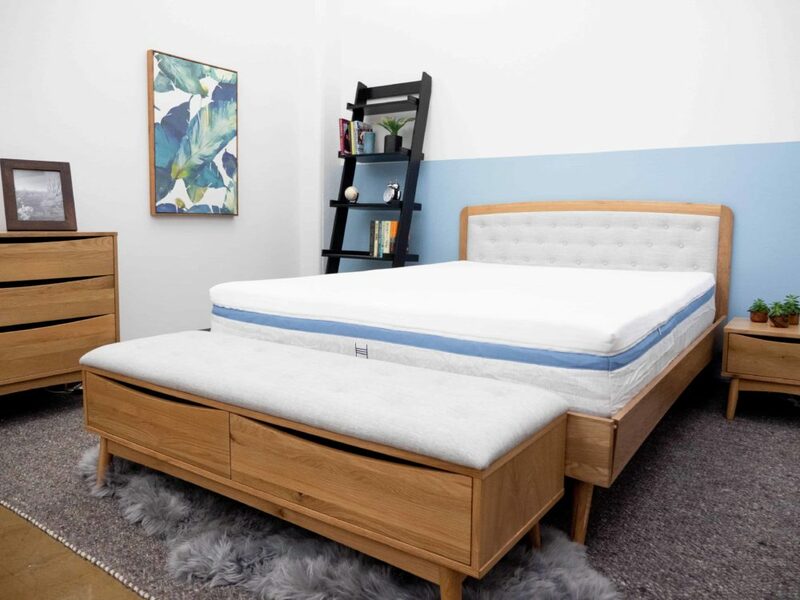 I really like the Helix mattress brand, especially since there are so many mattresses available that you can choose from, allowing people to really hone in on a mattress that would be ideal for them. I would probably be most interested in the Twilight mattress that they offer since I am a side sleeper and the Twilight mattress was designed with side sleepers in mind. The Moonlight mattress also sounds like a mattress I would be interested in trying out since you can move around easily on it and I tend to twist and turn a lot when I sleep. Thanks for the fantastic opportunity to win! I am a side sleeper and to me the softer the better. I think this might be the one. I think the Helix mattress looks very nice! Wow, a mattress made specifically for big and tall sleepers! Amazing! Sounds wonderful. I think the Helix mattress is just what I need. I would be able to finally get a perfect nights sleep on one.. I would love one of your mattresses for a better nights sleep. I have fibro and haven’t found the right mattress at those big stores. I think the Helix mattress is a good quality mattress and I love that there are so many to choose from. Thanks for the giveaway! Looks like a good mattress for me. My current one is 20 years old. What a great chance to get a mattress that really suits my sleep style. Thanks for the opportunity yo win. After so many back surgeries and sleeping on the worlds worst mattress I need yours, so that The pain would go away. I am a side sleeper I need the support on my hips but not to hard. This looks like an awesome mattress. I think the Helix is my answer to a good night sleep. I’ve recently been in an accident which has left me tossing and turning. I wake up with a bad back and neck. Helix can provide the support that my current 10 year old mattress can’t. I am in need of a new mattress. Have been shopping for about a year and can’t decide…..and the Helix looks like it would be perfect. My old mattress is 19 years old and sagging and sagging and sagging. I think this appears to be a very comfortable mattress….and, in my opinion, that is all that counts. :-) Thank you. I’m seriously considering Helix for our mattress. I took the quiz and just what I thought before I did so. I got matched with the HELIX NIGHTFALL. But I am curious.. Can you flip the mattresses? This would be amazing. My girlfriend and I both work at a children’s hospital and, let me just say, we need our sleep. We have been using a mattress that makes us both stiff and tired from tossing and turning all night. This would be an awesome mattress to help us feel better in the morning and give our best to the kiddos that need us. I have severe DJD of my spine, and would love to win this comfortable mattress!! Awesome giveaway!! Like the options on this bed.. I could really use a new mattress and I’ve been looking at all these different brands that mail out a mattress in a box, it’s so cool! Your mattress looks like it’s very comfortable and is made from good materials, like it’ll last a long time! The Helix Moonlight would be the best pick for me!! It sounds and looks amazing. Think the Moonlight is for me! I love all the options offered by Helix. Totally something for everyone. Love all the options Helix offers. There is something for everyone. I love the HELIX NIGHTFALL mattress and think it would be the ideal mattress for me. I really like that the Helix is customizable. Thanks for the opportunity, I want a Helix! Love to win this for my daughter! I’d much rather claim my prize and take it lying down. Of all of life’s essentials we could list here if you please. the simple truth is mattresses are life’s necessities. I’ll take my mattress home with me and cozy off to sleep. Sounds like a grat mattress. Would love to try one! This would be amazing to get free. Thank you for the chance to try it! Would love a new mattress! Really need several so if I win this and like it I will buy several more! Any of these would be better than what I have! A new mattress would be awesome. This would be a wonderful win. That Nightfall mattress sounds heavenly! Thanks for sweepstakes! I appreciate all the thorough work you did in researching and reviewing the Helix mattress for this giveaway. I love the fact that the Helix mattress is custom-made for each user. My back will thank you if I win. Sounds like a great mattress we’d like to try. Its amazing on how many different mattresses you have. The test was pretty cool. The Sunset is what our results came out. Thanks so much for this amazing opportunity. The Helix “Nightfall” sounds like the perfect mattress for me! I think the many options are awesome and that anyone could find a good fit for them. This sounds amazing! I would love the opportunity to sleep in one every night! Sounds Great! My mattress is so old, I don’t even remember how old. I like the fact the the line is not a ‘one size fits all’–they recognize that different sleepers require different types of mattresses. WOW!!! So much to pick from! So much great info!!! At this point I’m in love with the Moonlight mattress. I think I’d chose to upgrade the cover and get the Ultra Cool one! We need a medium firmness, I believe, because we’re both side sleepers. Thanks for the great review! I really like this mattress as it appears to be both soft and comfortable and at the same time gives good support. I love the variety of sizes too. It looks good! An important feature is stability when you & your partner are of different sizes. Wow, Helix has an extensive line. A choice for everyone. Looking for a new mattress soon. Back pain is not fun. Since I’m a side sleeper, Helix Midnight is definitely suitable for me over Moonlight. Interesting review. Thanks! Sometimes it’s so hard to find the right kind of mattress & they are also so expensive, so your afraid of being stuck with the wrong choice. I am desperate for a new mattress! Awesome review❤💯, I have read numerous reviews on this brand and I see that there is lots of good compliments😊. I always look at reviews before making a final decision on a product before buying. I also make sure I add my own reviews to help others out with their decisions. I am going to keep entering the awesome giveaways and hope to be one of the proud owners of one of the mattresses and add my review💯❤❤❤ . I hear my bed calling! I think it looks like a very comfortable mattress and I like that it’s cooling. I need both a cool and firm mattress so not sure that the moonlight or the midnight would benefit my husband and me. I think it is calling MY name. Would love to have a new mattress. Been far too long. Would be amazing to be able to pick a mattress that would fit all my needs as a side sleeper with back and neck injuries. Now after a full 2 years of searching, I’m wondering if I’ll ever find my perfect fit. This would be wonderful, so desperately needed! Like that Helix has different mattresses to chose from. It sounds like I would love it. My hip is bad and I can’t sleep on my mattress. I would love to win this bed due to not sleeping good with COPD. Oh my I would love to win this mattress I would appreciate it Thank you . This would be a perfect replacement for my 47 year old mattress with the nice sunken in place where I lay every night. My bed is old old old. I hope I win! Nice prize it looks so comfortable. This seems like a cool mattress! Helix Mattress, “Is a very Generous Brand” ! This bed appears to be very supportive. I would love to win the Helix moonlight mattress. Hi! Thank you in advance! This mattress would be great. I’m currently trying a Helix mattress and I’m loving it! Oh, it would be wonderful to win this mattress! Mattress looks really comfortable. I love that it sleeps cool. I need a mattress so bad for my aching back. Thanks for the opportunity and chance. The Midnight mattress serves me the purpose of heavenly sleep. I would love to win it!! Helix mattress looks like a quality mattress with good support, something I need! The Helix mattress looks phenomenal!! !I really wish that I had one! Looks so comfy!! Thank you so much for this wonderful opportunity and AMAZING giveaway! Please pick me! So many choices! I toss and turn every night, never getting a good nights sleep. I have been told that it’s probably because of the mattress. I would love to win one and test it out! Side sleeper in need of a new bed. Choice out of 9 is awesome. This is on my wish list. Always dreaming of a comfortable, good night’s sleep. This mattress looks like one could just sink right into it and get all comfy. It looks like an interesting choice. I have so many back problems and my current bed is at least 11 years old, so I REALLY need a new mattress. hope the right mattress does the job. My sciatica would love me if I won a new mattress! I hate the pain I’m in at night but right now I can not afford a new mattress. I would love to sleep on this quality mattress! A big plus you can clean it! would love to be able to sleep all night and not wake up stiff and sore! thanks! I love your reviews! It is time for a new mattress and I want to get one with support as a side sleeper! I really like the Dual Balanced and Dual Extra mattresses because you can utilize both sides depending on what you need. I’m chronically, and terminally, ill so it varies for me whether I need a firmer, or softer, mattress. I would choose one of these mattresses! I think I could use one in king size. Oh my neck would be so relieved by the comfort it offers. I would love to win this mattress for my daughter, who really needs one. What a great mattress. 9 different ones to choose from. These look so comfortable I may never get out of bed! My bed is like chunky peanut butter. I have a hard time sleeping and getting comfortable my back, neck and legs are always hurting.I toss and turn all night long.I think one of these beds would help me so much. Sure would be nice having a comfortable mattress to sleep on. This is so fricken awesome! I love It! I want to sleep on it and make sweet love to my wife on it. and make babies on it! It would be heaven sent to win a good mattress to finally wake up without pain. I’m so happy & grateful to get this opportunity. I can’t even remember the last time I was able to get a good night’s sleep.My husband and I have been in severe car accidents, leading to severe pain issues. We have a previously owned matress, it’s so old and lumpy that it’s impossible to get comfortable and to get more than a few hours of sleep. I’m really praying that we’re winners… it would literally change our quality of life. This sounds like a good mattress for me. I am mostly a back sleeper but I do sleep on my side some. I also like the feel of memory foam but I don’t like being hot. The midnight mattress sounds perfect!! I would love to win this mattress for my mom! She is disabled and cannot afford a new mattress. Her mattress is at least 30 years old and worn out. We can’t afford to buy her one as I’m also disabled. I would love to be able to win 2 because my husband and I also need a new mattress but my mom is more important. Great to have lots of info to aid in your decision. I bet this mattress would fix my body aches and all my restless nights!! This looks like a wonderful mattress. I hope I win it! I think the Helix Mattress looks very comfortable and would be very kind to my back. I think it’s an awesome mattress! I definitely want to get one of these. I really never new there were so many choices in mattresses. Without your reviews, I would have no clue. You do such a thorough job in telling the pros and cons. You were made for this job. I hope your mattress is the best there is; you deserve it for all of these tests. My husband and I both are in our 50s and suffer from Osteoarthritis. We really could use a new mattress and a decent night’s sleep. Can’t buy one at present….funds aren’t there and no debt, so winning would be amazing! Words can’t describe how happy I’d be if I won this mattress! I could really use a wonderful mattress like this! Thank you for the chance to win this bed. I would love a new bed as my current bed is about 14 years old. I had it since I was growing up as a kid in California. I always wake up with a sore back so thank you for sharing this. SOUNDS GREAT THE HELIX MOONLIGHT, WHERE CAN I PICK UP, MY WINNINGS??? Such an awesome giveaway. Would love to get a good night’s rest. With 9 different mattresses to choose from, I think Helix has everyone’s sleep modes accounted for!! I don’t think I would have any trouble finding the best one for me!! I’m dreaming of a good nights sleep! I can’t wait to sleep on it! I would be so grateful if I was chosen for this giveaway! I can’t even imagine what sleeping on a Helix mattress feels like! Thank you for the chance to win my dream bed! Like to have a new mattress. I need this mattress! It seems perfect and had my attention when it said it relieved pressure. I have back problems and this would be a perfect solution to my sleep problems. I would love to have a new mattress. My husband has 3 slipped discs in his back and our mattress is over 15 yrs old. The Helix mattresses sound awesome! I would love to try one out! I just need any mattress. The Helix mattress looks so comfortable and made with high quality materials. I love that this mattress has a memory foam layer I would love to own this it sounds so comfy. This mattress would be good for my daughter and husband – both are big and tall. Love the memory foam comfort! My son would love this! The Helix moonlight is the ticket for me! I am,super excited for this drawing. I think the Helix is amazing and so comfy looking! This is exciting! I could use a new mattress for my back problems. PLEASE I NEED THIS PLEASE I AM BEGGING YOU?? I think the Helix Mattress will suit all my sleep needs. Looks like I need the Helix Midnight. I really do need a new mattress. After back surgery and several nerve burnings and other back and knee problems, I’m in desperate need of a new mattress. Thank you for the opportunity to WIN !! I need a new mattress bad! I think this mattress looks very comfortable! I wish I could find a mattress that is good for my back and hips. So far no luck. It looks super comfy. I was looking at one the other day. Seems really good quality! Yes! Desperately need this….. major back problems. May I come work for you to test out bed? I’d love to be able to get a good night sleep on a new mattress and trying out different ones all of the time sounds rather “dreamy”, get LOL ok I’ll stop. Helix looks like a great mattress with so many choices one is bound to find the perfect mattress match. I have a Hammy down bed at would love a new one, This one is so old That I’m sleeping on. I always like the firm. What a great mattress. I would love one. I sure could use a new mattress. I will love to win a new mattress please my mattress is old and they cost to much the one I have hurts my back I really need to win one ok. Thank for ur time. Nightfall is super intriguing. I wish they made a Plus version of Twilight. It seems ideal but wouldn’t be suitable enough for my weight. First, Thank you for the chance to win one of these great mattresses. I think they look very comfortable and sleep-worthy. Good Luck Everyone!!!! The Heliz mattresses look so comfortable and so many choices! Loving the 6 new additions which to choose!? Thanks for the amazing chance! Helix has quite a line-up of mattresses! Is this how you enter the sweepstakes to win a Helix mattress? I think the Helix mattress’s sounds wonderful with so many different ones to choose from.The Nightfall mattress would be great for my husband,but I need one for side sleeping with hip pain. I love a in between mattress that is both firm and soft. I’m wondering why it’s called Helix? to have a new one. This would be nice to win! My current bed is old and falling apart. Helix Moonlight Mattress sounds like the bed for me.I need something that works on pressure points. After two major surgeries, I’ve found it difficult to get a good nights sleep. I would love the opportunity to get a Helix mattress that would help me gain quality of life again. Good luck! At 70 years old now and suffering with a genetic disorder that tortures my body, I could use a new mattress for sure and sleeping is something that is difficult for me due to pain. Would love to win one of your mattresses. Thank you. Nice giveaway, hope I win! This mattress would truly be a blessing. It looks so comfy. Really need a new mattress, the one I’m sleeping on , if you can call it sleeping, is killing my back and neck since my 2 surgeries. I used to sell bedding for a living at one point and this is amazing. My husband and I could really use this. We spend 1/3 of our lives in our bed so what a wonderful product this is! I need a new mattress of this quality right now ! I did the Helix quiz and it told me that I fit a Helix Dusk. $995 for a queen, great price! Our mattress is 20 years old, hot and very uncomfortable so I know we would enjoy a Helix Mattress. I would love the helix mattress. Hubby and I both have had bak surgery and still have pain. I think it looks perfect for me! I love the hybrid and it looks cushy enough on top with good support. Won two years ago. Thanks again. Hoping for a repeat victory. I like the variety of sizes and firmness levels ,there is even a soft and cushy one for me,these look very comfortable and I love the pressure relief they provide. I love that you can remove and clean parts of this mattress it has great reviews and look so comfortable!! Awesome! The mattresses look so plush and soft! Looks amazing! I would love to try this out and get some good sleep for a change. This mattress seems perfect for my back. It takes me 45mins to get out of bed each more because my bed is so hard and kills my back. It doesnt help that i already have chronic back pain. We sleep differently, but will work for us and cooling too. Perfect for our recent first home purchase too. This Helix mattress looks ridiculously comfortable! I like that the mattress rated well for firmness. I am a side sleeper and it seems that many mattresses are too soft. I just want to sink right into one….. So many great qualities to choose from would love to win. Thank you for the chance! I like the face that there are so many choices of firmness, looks like it would meet the needs of both of us. I would love to win. We really need a new mattress soon! So much variety! So many choices! Love it! Due to a car accident that has left me with chronic neck pain, I could really use a comfy mattress! It looks like Helix has the right combination for me…a side sleeper, but needs some good edge support. This mattress sounds awesome. I think this would be great for my bad back and old bones!!! I think the Helix mattress looks super nice and comfortable. I have a need for this. It looks very comfy. I really need a new mattress for my California King bed! I would love to win this for my disabled son and wife! Thank you so very kindly for this amazing opportunity! Good Luck to All!! I absolutely need this! My mattress is in desperate need of replacement! The Nightfall Mattress looks like a dream come true. Im 5’10.and my husband is 5.7 but over 300 lbs.with sleep apnea. Our bed is so old, if we get a few hours of rest, we still wake up more tired than when we passed out.ANY sleep is precious in this house, but we are getting older and tired of running on fumes. Thank ypu so much.Very grateful for the chance. This Helix mattress sounds heavenly! I need better sleep! Love your brand! looks very comfortable. I would love a new mattress. I would love to win, i have bad back and really like to take pain away. Look so comfortable. Definitely a good selection of mattresses that Helix has now. Would love to try the Midnight one. No downside seen with the Helix. It’s a customized mattress. Thank you for another chance. Fingers crossed. Would absolutely love to surprise my husband with his he has fibromyalgia and sleeps on the couch. I think I would love this mattress. It looks like it’s so comfortable and it wouldn’t make my back hurt. Could use a new mattress. Trying to find one but hard to find a comfortable. I really wish I had one of these. I am currently seeing a Chiropractor but I think if I had the right mattress it would solve alot of my problems. It looks and sounds so comfy. This mattress seems like a perfect fit for me. I would love to win as right now I sleep in a recliner. Wow, I’m currently shopping for a new mattress, and I’m impressed with the line of mattresses from Helix… I’m particularly interested in the “dual” mattresses! This would be great to win. I think Helix has a terrific lineup of mattresses. There’s something for everyone. Love that there are so many choices! This is awesome! We desperately need a better sleep!